Selected items are 10% off for mother's day...now until May 8th, take a look! 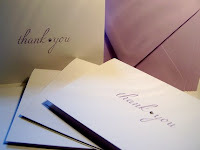 Simple Thank You Notes: 10% off - Customize these just for your mom - with her name, a favoriate quote or scripture. You will receive 6 note cards measuring 5.5 X 4.25 inches (folded). Each note is embellished with a matching Swarovski Crystal. Printed on 100 lb. smooth card stock. Choose from, purple, pink, green or brown inks. Mom Notes: 10% off a set of 8. 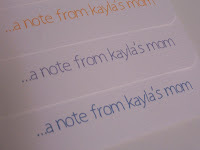 Admit it...at your child's school, at sporting events or even on play dates , no one knows you by your own name, you are known as your child's mom...so why sign your stationery that way...I love these and use them all the time for sending notes to school. Printed on 88 lb. cotton cardstock.